This cute porker has a big fan club. It's adored by children and a wonderful gift or recognition idea for students in 4-H and FFA clubs. 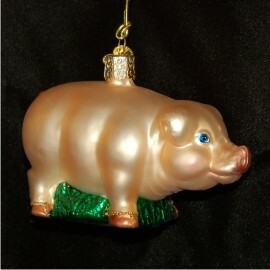 The realistic shaping and coloring are part of the appeal to this big pink pig glass personalized Christmas ornament that arrives snug in our black velvet bag. Browse all of our animals ornaments personalized by our calligraphers for other realistic critters including a black and white pig and our country porker pink pig that make wonderful friends for this pink pig glass Christmas ornament.